(Nanowerk News) Geckos, spiders and beetles have shown us how to do it: thanks to special adhesive elements on their feet, they can easily run along ceilings or walls. The science of bionics tries to imitate and control such biological functions, for technological applications and the creation of artificial materials. A research team from Kiel University (CAU) has now succeeded in boosting the adhesive effect of a silicone material significantly. 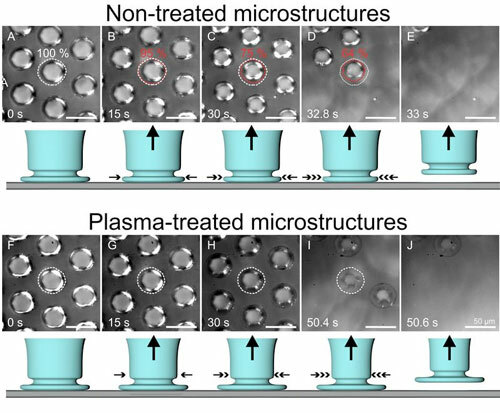 To do so they combined two methods: First, they structured the surface on the micro scale based on the example of beetle feet, and thereafter treated it with plasma. In addition, they found out that the adhesiveness of the structured material changes drastically, if it is bent to varying degrees. Among other areas of application, their results could be interesting for the development of tiny robots and gripping devices. They have been published in the latest editions of the scientific journals Advanced Materials ("Combined Effect of the Microstructure and Underlying Surface Curvature on the Performance of Biomimetic Adhesives") and ACS Applied Materials & Interfaces ("Bioinspired further enhanced dry adhesive by the combined effect of the microstructure and surface free energy increase"). Professor Stanislav N. Gorb and Emre Kizilkan from the Functional Morphology and Biomechanics working group are researching how to improve the adhesive properties of silicone elastomers. Their example to mimic is the surface structure of certain male leaf beetles (Chrysomelidae), looking like mushrooms. In two recent studies, they discovered that silicone elastomers adhere best if their surface is modified into mushroom-like structures and thereafter specifically treated with plasma. The electrically-charged gas which is the fourth state of matter, alongside solids, liquids and gases. Thus, the researchers combined a geometrical and a chemical method, to imitate biology. In addition, they showed that the degree of curvature of the materials affects their adhesion. "Animals and plants provide us with a wealth of experience about some incredible features. We want to transfer the mechanisms behind them to artificial materials, to be able to control their behaviour in a targeted manner," said the zoologist Gorb. Their goal of a reversible adhesion in the micro range without traditional glue could make completely new application possibilities conceivable - for example in micro-electronics. In a first step, the research team compared silicone elastomers of three different surfaces: one unstructured, one with pillar-shaped elements and a third with a mushroom-like structure. Using a micro-manipulator, they stuck a glass ball onto the surfaces and then removed it again. They tested how the adhesion changes when the materials with microstructured surfaces are bent convex (inwards) and concave (outwards). "In this way, we were able to demonstrate that silicone materials with a mushroom-like structure and curved concave have the double range of adhesive strength," said doctoral researcher Emre Kizilkan, first author of the study. 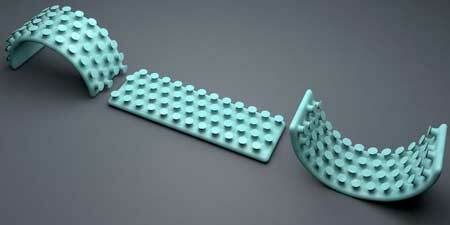 "With this surface structure, we can vary and control the adhesion of materials the most." In a second step, the scientists treated the silicone elastomers with plasmas. This method is normally used to functionalise plastic materials, in order to increase their surface energy and to improve their adhesive properties. In comparison with other methods using liquids, plasma treatments can promise greater longevity - however, they often damage the surfaces of materials. To find out how plasma treatments can significantly improve the adhesion of a material without damaging it, the scientists varied different parameters, such as the duration or the pressure. They found that the adhesion of unstructured surfaces on a glass substrate increased by approximately 30% after plasma treatment. On the mushroom-like structured surface the adhesion even increased by up to 91%. "These findings particularly surprised us, because the structured surface is only half as large as the unstructured, but adhesion enhancement was even three times better after the plasma treatment," explained Kizilkan.